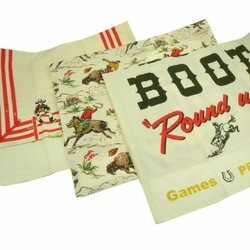 Find unique gift ideas for Cowgirls. Western home decor, fashion items, jewelry and more. Most likely the first thing on her list would be a good horse. Then there would be a big barn and nice pasture, pretty saddle and of course and fine truck and trailer to get here around. WOW! You were looking for gift ideas weren't you. ha ha ha Those are all great ideas and go for it if you can. If not, here are some suggestions that any cowgirl or woman who loves horses will surely appreciate. Update- I have added more pages to my website that feature more specific items. Those are shown at the bottom as related pages. Home decor items can reflect a cowgirl lifestyle and chances are that if you walked into the home of a woman who enjoys the western life, you will find some framed photos of her with her horse or other western prints on the wall. For this reason, I believe that you can't go wrong with a getting her an extra frame or two. Leather, faux leather and leather print are perfect and go with any western decor. This is a polyresin frame that has the look of worn leather and holds 4x6 photos. This wall cross is 9 1/4"L x 12 1/4"H. It is hand painted and accented with acrylic stones. Check out this full page of beautiful western crosses. A gift any cowgirl would love, figurines or statues of a woman dressed western or on a horse. Many people collect figurines and either of these would be a nice addition. Cowgirl kicking it up on her horse depicted on this 7 1/2 in figurine. 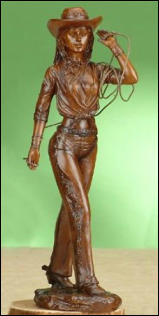 A 9 1/2 inch faux wood cowgirl statue decorated with a bronze finish. A set of salt and pepper shakers would be great for a housewarming gift or even a western bride. They can be found in a variety of shapes such as boots, hats and spurs. I think this set with a belt and buckle will go well in any western themed kitchen or look very nice on a dining table. ​100% cotton dish towels to dress up the kitchen. These hand painted wine glasses show the spirit of a cowgirl and can be filled with her favorite drink. It also has a recipe printed on the bottom of the stem for a special cowgirl drink. Collect corks from special occasions in this decorative cowboy boot cork cage. It is made of metal and is tall enough to hold a bottle if you want to include one. A western belt and buckle are great fashion accessory for any woman and one of each is never enough. 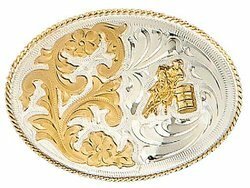 Throughout my rodeo career, I have won many belt buckles that I like to wear, but of course belt buckles can be purchased that are very similar to rodeo belt buckles and some that are a western style in general. An option for a sweetheart gift could be a heart shaped belt buckle that she can wear as a reminder of your love. If she loves horses, she will appreciate this buckle with a horse head and feathers. This is also a nice rodeo event belt buckle featuring a cowgirl bunning barrels. It is highlighted with gold plated details and a rope border. If she has won some belt buckles an need a nice way to display them, see my belt buckle display page. When I was 13 years old, I received my first official piece of western jewelry, a diamond horseshoe ring and I still have it today. Over the years I have received and bought for myself other ear rings, bracelets and necklaces with a western theme. It is not necessary to be dressed in a western outfit to bring a little western to anything you are wearing. Horseshoe rings are still around and some include additional detailing. Here are a couple of my favorites. The horseshoe ring with a horse inside. This ring has additional details including the 10k gold horse head . 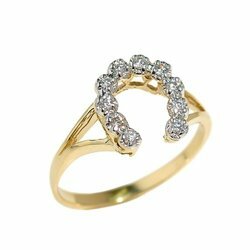 This is an very affordable 10k yellow gold horseshoe ring with cubic zirconia stones. Necklaces with a western flair or that plainly say cowgirl will be a treasured gift. I found this very unique cowgirl necklace that is made from a spoon. Look close and you will see that it is a spoon hammered for texture. 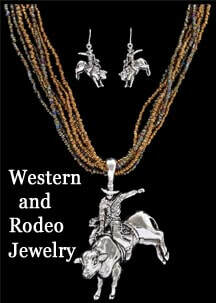 It is inscribed with the words Cowgirl At Heart and comes on an 18 inch chain that can be extended. This Cowgirl At Heart necklace is heart shaped and comes on an 18 inch chain. It is reversible so that it can be worn showing the Cowgirl At Heart inscription on the other side. Cowgirl at Heart - Sterling Silver Plated Horseshoe and Heart Pendant Necklace, 18"
There is more western and rodeo themed jewelry here. Cowboy boot socks are designed to look like a cowboy boot. They are a unique and fun idea for a cowgirl gift that can worn with boots or just around the house for warm feet. These are from Ariat a popular brand in western clothing. They come in several different colors. Have you seen these cozy slippers that look like cowboy boots. Will she get a kick out of this horse shirt? 50 shades of Hay . It's funny, but the another cool thing about it is that there is no tag in the back to bother your neck. A fleece blanket with a cool cowgirl print would be great for snuggling up on the couch or used as a decorative cover for the bed. The top side is printed and the reverse is ivory colored. They are available in different sizes. Western throw pillows that she will love. Tin signs can be used to decorate most anywhere in the house or even hang them in the barn. This is a lovely sign showing a cowgirl with her horse. It measures 12 1/2 x 16. This cowgirl sign is made of wood and measures 9 1/2 inches by 5 1/2 inches. A fun sign for inside or outside. It is 12 inches tall and 8 inches wide and made of plastic with vinyl graphics. There are pre-drilled holes so it is ready to hang. Help her relax or sooth away the pain with this spearmint eucalyptus cold pack. It is made of cotton and fully lined. Does She Have A Horse? How about some new tack? That is a gift she can share with her horse. .Check out my collection of western themed tote bags. Still looking? Visit my other pages with western wear and home decor for more great ideas. Here are a few examples of the cowgirl gift ideas including posters, can koozies and t-shirts.